I used one pound skein Red Heart Giant and size 9 29" circular needle. Use whatever yarn you wish with an appropriate size needle. This blanket is knit on the bias so gauge isn't all that important. 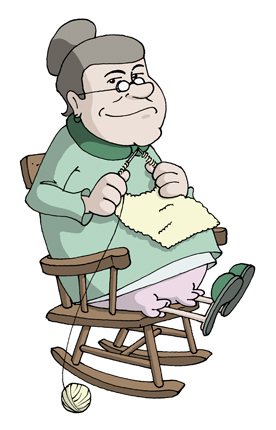 Just keep knitting until the side is as long as you want the blanket to be and then begin decreasing blocks for the second half of the blanket. 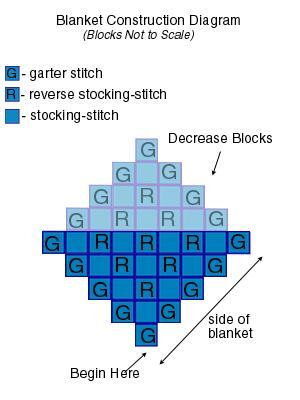 Continue in this manner, with garter stitch block on each end and alternating stocking-stitch and reverse stocking-stitch for each block section until the side of the blanket is as long as you wish. Then begin the decrease blocks. Continue knitting this section in pattern until 10 rows are complete. 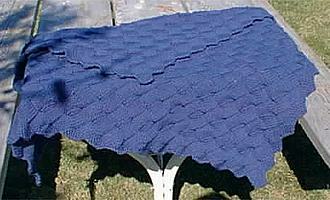 Every 10 rows, bind off one more block on each end of the section and keep in pattern per the diagram.